Democratized: a transparent electricity sector that provides more choices to people of all income levels, including equitable access to distributed generation – especially solar energy – as well as participation in other aspects of the electricity system including demand response. Maryland’s Dysfunctional Residential Energy Supply Market explores how Maryland households have paid $255 million more than standard utility rates to third-party suppliers in the period 2014-2017. Low-income households appear to be affected disproportionately. A significant portion of energy assistance dollars wind up in the third party supply coffers instead of lowering bills for low income households. This report by Laurel Peltier and Arjun Makhijani was funded by the Abell Foundation. Arjun Makhijani, IEER’s president and Laurel Peltier (journalist and Maryland citizen) comments to the Maryland Public Service Commission on the Office of Home Energy programs FY 2019 budget regarding inadequate information and inadequate protection of low income consumers from high charges by third party suppliers. Read their comments and recommendations. The entire record of the PSC’s hearing on August 14, 2018 on this topic can be found here on the PSC website. This Op-ed by Arjun Makhijani published in the Frederick News-Post shows that offshore wind energy is now competitive with grid electricity. Massachusetts just announced that it will build a large scale offshore wind farm. Maryland should do the same. 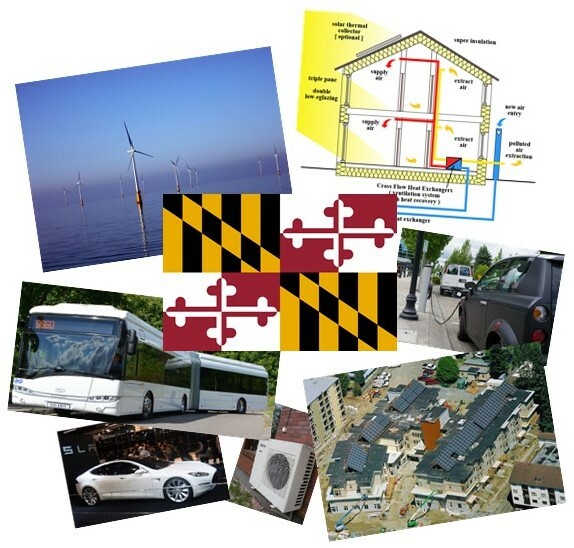 Visit the 100% Renewable Electricity Supply for Maryland resource page to download two short reports by Arjun Makhijani: Technical Feasibility of 100% Renewable Electricity by 2035 and Estimate of Economic and Fiscal Impact of Maryland’s “100% Clean Renewable Energy Equity Act. Maryland can achieve a prosperous, renewable, and healthy energy future at lower cost than pursuing business-as-usual with fossil fuels. It has plentiful renewable energy resources to do so. It is a recipe for healthy prosperity that will save Marylanders between $1.3 billion and $7.3 billion a year (2011 dollars) in energy costs in 2050, even after making provisions for (i) assistance for low income households to pay no more than 6 percent of income on energy bills, (ii) proactive investments in communities now dependent on fossil-fuel-related jobs, and (iii) new job creation in underserved areas. Visit the Prosperous, Renewable Maryland resource page to learn more, download the full report, and order the paperback book copy of the report. Arjun Makhijani presented four points at the Maryland PSC Grid Transformation Proceedings: (1) Nuclear energy is not renewable; (2) Baseload and the future grid; (3) Non-energy benefits of an affordable energy program; and (4) Limiting energy bills to an affordable amount for low-income households. Visit the Maryland’s Grid Transformation resource page to learn more and to download the full testimony. This discussion paper presents a strategy for protecting workers and communities that may be threatened by the current and future transformation of the U.S. energy system. It is derived from the recognition that recent technological developments have made solar and wind energy, in combination with efficiency, cheaper than continued reliance on fossil fuels. An economical transition to an energy system that is nearly emissions-free is possible. The transition will provide enormous benefits, both in terms of climate protection and to workers and communities. The new energy system will be cleaner, and more resilient. Air pollution will decline. Solar and wind energy require essentially no water at a time when stress on water resources is becoming an ever larger economic and ecological issue. Visit the Beyond a Band-Aid resource page to learn more and to download the full report. In this report we analyze the reasons for the high energy burdens faced by low-income households, which cause many types of distress including conflicts between paying energy bills and paying the rent or mortgage, buying medicines, or going to the doctor. Energy assistance helps a great deal but its reach is limited and burdens often remain too high even after assistance. We propose an Affordable Energy Program that would limit energy burdens to 6 percent of gross household income, universal access to solar energy in a manner that would make electricity cheaper, and efficiency programs that would reduce the cost of assistance as well as the need for assistance. Economic justice is a complex issue, with energy being just one part of the picture. Yet energy justice – defined here as meeting one’s needs for the services that energy provides at reasonable cost, with fair and equitable access, and without disproportionate economic and environmental burdens – can mitigate the problems and pressures in other areas, especially when efficiency and solar energy are developed so as to create local jobs. Visit the Energy Justice Report resource page to learn more and to download the full report, a one-sheet summary, an infographic, a slideshow, and order the paperback book copy of the report. A slide presentation to the Maryland Public Service Commission for Public Conference 40 on Distributed Energy Resources, by Arjun Makhijani, on October 10, 2015. Visit the Net Metering and Distributed Energy Resources resource page to learn more and to download the full presentation. Maryland Public Service Commission commissioned a study regarding “the advisability of establishing an opt-in electric affordability program for residential and small business customers.” The study did not recommend a statewide opt-in program for all residential and small business customers. Rather, one of its principal recommendations was that the PSC consider and address “affordability initiatives for low-income customers.” This recommendation is crucial in light of the widespread recognition that existing heating and electricity bill payment assistance programs “are not a long-term affordability solution” even though they provide considerable relief by lowering energy burdens. Visit the Electric Affordability Comments resource page to learn more and to download the full comments. Space heating and cooling accounted for well over one-fourth of Maryland’s primary energy use in 2011 and more than 21 million metric tons of CO2 emissions. Achieving a nearly emissions-free energy sector in Maryland by 2050 will mean converting the vast majority of fossil fuel space heating systems to highly efficient electric heating systems (like cold climate heat pumps and geothermal heat pumps). This report assesses present space conditioning costs and the costs of a transition to a space heating and cooling sector that is “renewable-grid-ready.” In other words by converting to electricity, HVAC systems can be run on renewable electricity and emissions will decline as the proportion of renewable energy on the grid increases. The conversion from natural gas to efficient electric systems will be most complex because natural gas cost is low compared to other fuels like oil and propane. The upfront costs of efficient electric systems is also an issue. The report examines policies to make the conversion more feasible. It also analyzes the implications for long-term natural gas demand if a transition to electric space heating systems is made. Visit the report’s resource page to learn more and download the report [PDF, 1.6MB]. Comments on the Exelon proposal to acquire Pepco Holdings, Inc.